… five years later, Earth is a world without superheroes, but not inspiration, as broadcaster Alan Scott ensures people don’t forget the sacrifices made. Meanwhile, college graduate Jay Garrick is discovering he’s anything but a hero to his exiting girlfriend, as she rips into his character. By issue’s end, at least one of these men is on the verge on a destiny he couldn’t have dreamt of. 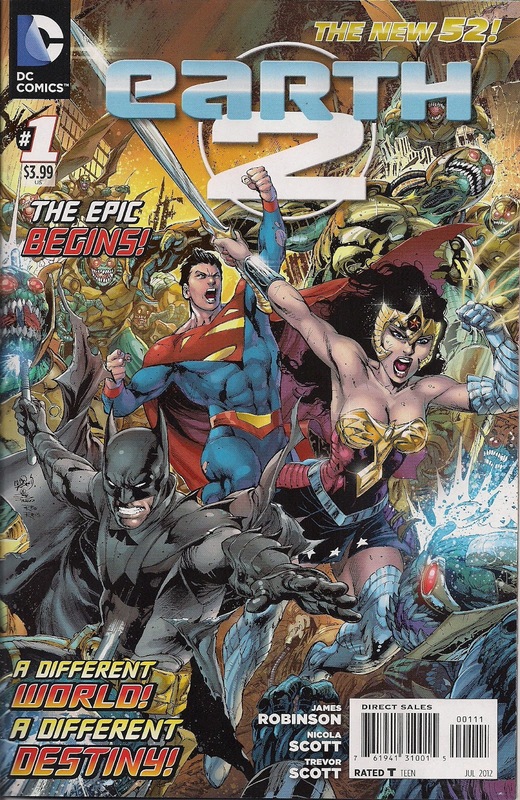 So here it is, Earth 2, one of four replacement New 52 comics debuting this week from DC. And even given the track record of core creators James Robinson and Nicola Scott, this is better than I could’ve hoped for. True, this isn’t your father’s Justice Society of America, but the comic rings with the values held by DC’s first super-team: valour; friendship; sacrifice; love. Forget the pre-publicity from DC that had fans fearing the Earth 2 versions of Superman, Batman and Wonder Woman would be bloodthirsty anti-heroes, they’re very much the heroes we know – but ones viewed through the lens of war. Wonder Woman slices through Parademons, but the creatures from Apokolips have killed so many dear to the heroes, and if allowed to live, will only kill more. We don’t see Superman slaughter, and I suspect he still holds back. As for Batman, it’s fair to say he takes out a few baddies. The other fan fear was that the so-called Trinity would dominate the book, to the exclusion of such promised heroes as the Flash, Wildcat and Green Lantern. Not gonna happen. The Big Three are taken off the chessboard, clearing the way for a second wave of heroes. And that’s ‘wave’, not ‘generation’. The heroes about to be born are still the first generation of Earth 2 heroes, they just debut a little after the founders, as they did in the Golden Age of comics. And as it was in the halcyon days of All-Star Comics, Superman and co won’t be around, but their presence will surely be felt. Robinson’s script is a cracker – pacey, confident, revealing characters through the fires of war and the quieter conflicts of peacetime. We get to know Superman, Batman and Wonder Woman, and are introduced to Supergirl and Robin before circumstances shunt them off to Earth 1 (and another of this week’s new titles, Worlds’ Finest). The Apokolips conflict also introduces US Army sergeant Al Pratt, who’s set to show that might isn’t a matter or height as the Atom. And there’s a grunt named Harper, who may turn out to be a new version of the Guardian. There’s no doubt Jay is going to be the Flash, and there’s a welcome twist to his origin here, one that makes sense in terms of his traditional image, while linking him to one of the lost heroes. As for Alan, he’s on his way to China, so I’d not bet against him coming across a lantern of emerald hue. My favourite scene sees one of Wonder Woman’s patrons manifest on Earth to tell her just how desperate things are, and to deliver a very personal message of thanks. It fits the story perfectly, while reminding me just how much I miss the relationship Diana once had with her gods. It also gives penciller Nicola Scott and inker Trevor Scott a standout moment in a book that is nothing but standout moments. The visitor blazes across the page, leaving no doubt that this is an unearthly creature, and one whose influence will be felt for a long time to come. The emotion Diana feels is palpable, spurring her on to greater heights. It’s wonderful, and sad, that the Diana we meet here seems so much more like Wonder Woman than the New 52 version; a beacon of hope and courage. And her costume looks so much better than the ‘real’ Wonder Woman’s that it’s ridculous. The same goes for the outfit worn by Superman, a sleek update on the classic. As for Batman, well, you can probably guess. The battle against the parademons is glorious, as both sides attack as their natures demand, in a fallen city. And when the peace comes, Scott, Scott and colourist Alex Sinclair, whose contribution is immense, show they’re equally good at drawing the everyday. Well, the everyday so far as a universe filled with heroic potential is concerned. Kudos, too, to Dezi Sienty for a top job of lettering this extra-sized issue, editors Pat McCallum and Sean Mackiewicz, and everyone else involved in this corker of a debut. Such as cover artists Ivan Reis, Joe Prado and Rod Reis, who produce a great tease for the interiors. This book immediately enters my list of top five DC comics. it’s not perfect – forget the deaths and devastation, James Robinson makes a longtime supporting cast member thoroughly unlikable – but it’s a smart, exciting superhero comic that’s tapping new potential in classic characters. If you’ve ever been a fan of the JSA, give Earth 2 a try – I think you’ll like it. Refreshing to read something actually good for a change. Maybe a trifle too bloodthirsty for me but everything else fell neatly into place. A very worthy effort all round. I was going to give this a wide berth, I'm a big fan of the Justice Society and I didn't hold out a lot of hope – most of the new 52 hasn't been to my taste ( 'cept Aquaman & Action Comics ) – but I might give it a shot now, after reading your review. still not picking up World's Finest, though. I agree making Joan needlessly unpleasant was a misstep–given her new employer, however, I presume we will be seeing her again, so its' hopefully more than Robinson's patented “Cry for Justice” character destruction. Great review, Martin. This one really exceeded my expectations (that DC publicity seemed intent on lowering). I'm in for the ride! Actually four of the wave 2 books came out this week. GI Combat also came out. Sometimes I think DC issues writers with a script template including an obligatory stabbing scene. Hopefully they'll get as tired of the unnecessary violence as we have and stop including it. I'm sure you're right, and she may come to appreciate Jay once she settles in at Rex Tyler's firm. Cometh the hour, and all that. Glad you liked it too, Rob! Thanks Colton, dunno how I missed that one, I'll pick it up when I pop into the shop on Saturday for Free Comic Day. Meanwhile, I'll fix the review. You're a star! I liked the sub-plot of Al Pratt lugging an atom bomb through the jungle (along with Jim Harper, possibly?) I hope that goes somewhere, as it was too unsubtle just to be a random reference. I really enjoyed this and can't agree more with your review, Martin. There was a lot of worry (some from me) that it would be blood and guts from the main three as they're all prepared to kill, but that was nicely subverted. One thing, though – you say “We don't see Superman slaughter” but look to the skies in the splash page with Mercury and you may have to rethink that line! I liked it too – as for where it's going to go, you think BOOM!? I was blown away by the fact that the big three were killed almost immediately–very unexpected! I enjoyed it though, and like you pointed it paves the way to focus on other characters that might otherwise by overshadowed by Trinity. I also really dug the altered origin to Jay Garrick and I hope this will be a tenant of the serial. I can't wait to read more! I'm perturbed by rumours that Superman may have survived (though his death did seem less definitive). I hope he's gone to his reward, much as I love all Supermen.